George Benson Ltd has a unique 4 stage process developed to resurrect and revitalise the dullest of fabrics. Most work can be scheduled to ensure daily business routines are unaffected. We can tackle emergency situations (such as spilt coffee or inks), or periodic removal of stains which build up over time. Thus restoring tired fabrics to near original condition and prolonging the life of the material. 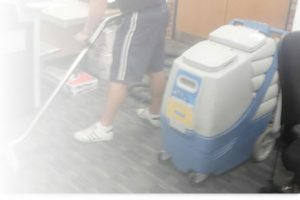 Stage 1: A thorough vacuum of the area to be cleaned using industrial cleaning equipment – dislodging and collecting large pieces of dirt, dust and debris. Stage 3: Extraction through a hot water extraction system (HWE), the rinsing agent is fed through a heater tank onto the carpet invigorating the fibres of the carpet. The liquid is then extracted via a stainless steel ‘wand’. The residue is then deposited to a waste tank leaving your carpet clean and invigorated. Stage 4: A Carpet Bonnet is then deployed to dry the area thoroughly and raise the pile. This will conclude with a clean and dry carpet ready for many years’ use!